We want to introduce you to CDH International’s Ohio Ambassador, Andy Johnson. Andy is the mom to cherub Riley. 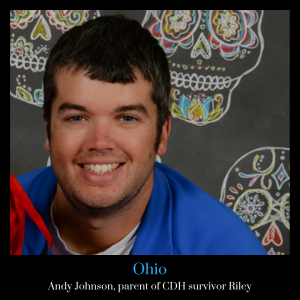 Andy is a math teacher and varsity football coach at Beavercreek High School in the Dayton area. His wife, Alyssa, works at Cedarville University as a program advisor. They have two daughters, Riley (2 and 1/2) and Sophia (6 months) who keep them busy! They try to volunteer with the special needs community in their area as much as possible; Alyssa with the all-stars dance team and both of them with Owen’s Place Community Park. They love going to sporting events, playing outside, and hanging with friends and family. Andy and Alyssa just recently finished leading Young Life (a Christian outreach program) in Beavercreek after many years! They have recently volunteered to be the Cherubs Ambassador in Ohio to be a resource for others who are going through the CDH journey. They discovered their daughter’s CDH at their 20 week ultrasound. There were several other medical issues they found too, all rooted in a rare genetic disorder that Riley has. She was born at full-term, but only weighed 4 pounds 8 oz. Her genetic condition (which kept her undersized) and the 90% missing diaphragm really set the odds against her. Riley is a fighter and made it through multiple repair surgeries in the Cincinnati Children’s Hospital NICU. They were able to come home after 3 months (which was way before they had originally anticipated!) and Riley has been growing little by little ever since. She is now 2 and 1/2 and is a big sister to little Sophia. Hey Andy! Your story seems like such a rewarding struggle. I’m happy anytime I see anyone that’s been to Children’s, that’s where my Samual was born. We love to help, it’s a mission of mine. Let us know any way we can help with anything! Also, if you come across any Ohio baby going home from the hospital please contact me. They get first priority with our Owlet Smart Sock 2’s. I look forward to hopefully meeting you and yours! Thank you for representing us!